The Big Top rolled into Simi Valley Wednesday night for a little debate with your favorite republican candidates. There were two debates actually. 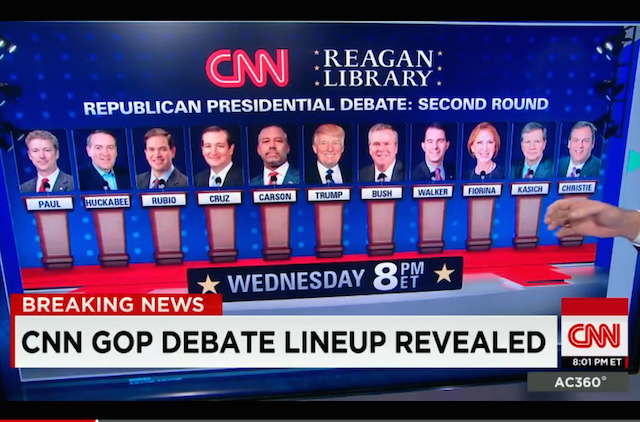 Four dudes who are out of the race but haven’t got the memo yet, debated at 6pm eastern. It was as unremarkable as it sounds. Once the under card was cleared from the stage inside the Reagan Presidential Library, it was time for the big boys, and woman, to throw down. Want to know what happened? Wanna know who won, who lost and who is probably done? For that you gotta click. This entry was posted in Uncategorized and tagged 2015 republican debate, ben carson, Chris Christie, cnn debate, fiorina, jeb bush, reagan library, Rubio, Ted Cruz, trump.